Manufactured to required size. Available in any length up to 3000mm plus width up to 900mm. Thickness from 3mm upwards. Standard colors are black, grey, yellow but can be produced to any B.S. or RAL colors. 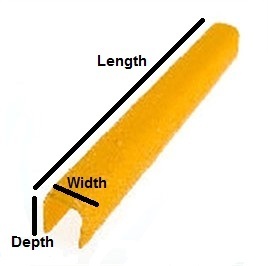 (Gritted or non - gritted) Suitable for use as edge nosing or non-slip cover angles. Manufactured to required specification. 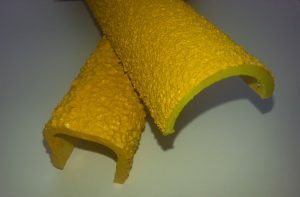 Treads can be manufactured using high quality fire retardant resins which meet Class 1/0 fire rating. For the ultimate in fire resistance PHENOLIC resins can be incorporated which produce virtually no toxic smoke and fumes in the event of a fire. Suitable for use on offshore and underground applications. Extremely rigid GRiP coated WBP plywood. Available as cut sizes or in standard sheet sizes. Used on railway bridges, platforms, and as trench cover plates. Solid GRiP chequer plate available in any thickness from 4mm upwards. Can be produced in any color and in a range of fire ratings. Produced as either single tiles or "blocks" of 3,6, or 9 tiles. Any thickness and BS or RAL colour. Available in either on street or off street patterns. Tiles can be glued and mechanically fixed to existing substrates, thus avoiding expensive excavation costs. Panels are manufactured with an adhesive accepting surface, suitable for use where customers may wish to apply their own type of grit or stonechip finish using epoxy adhesive systems. **Available in any thickness 3mm plus, and any base color. 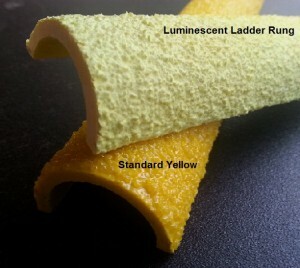 GRP Anti-slip ladder rung covers provide excellent traction to existing slippery or worn ladder rungs due to the robust alumina oxide grit incorporated into the rung cover. GRP Antislip step nosing can also be manufactured with a distinctive �five bar� chequer plate pattern where aesthetic considerations are of importance. Available in a wide choice or combination of colours.